When you think about owning a luxurious home, you probably think about an elegant kitchen with beautiful granite countertops and stainless steel appliances, a living room with elegant furniture and nice hardwoods, and a dining room that would make your friends and family salivate. But what do you think of in terms of a luxurious bathroom? Updating your bathroom can add to the value of your home, but this doesn’t mean you have to have deep pockets for a complete renovation. If you’re looking to update your bathroom slowly and seek the best deals out there, you can have the bathroom of your dreams without breaking the bank. Whether you’re working with a plain bathroom sink that looks dull and tired, or you simply are done with the vanity you currently have in place, do some research to consider what a new vanity might mean for you and your home. While there are plenty of expensive vanities out there made of steel and stone, your less expensive options will be those made of wood. These can still provide your bathroom with a significant face lift while keeping more money in your pockets. When choosing the right vanity for your bathroom, you’ll want to consider how it fits in the room. Will your vanity fit well with your trim, baseboards and ceiling? You don’t want to make your bathroom look like an Andy Warhol painting with all different types of colors clashing against one another. If you’re on an extremely limited budget, try to not get carried away thinking that you need to redesign your bathroom’s layout. Keep your focus on what you can do with your current floor plan so you don’t incur additional plumbing costs down the road. When you want a new look to any room, a fresh coat of paint is a great place to start. Prepping your bathroom for new paint requires a bit of set-up, as you’ll want to prime your walls before painting them. However, if you have a bit of extra money to spend, there are plenty of paint and primer combination paints available to help you do it all in one stretch. Once you’re ready to paint, make sure to do at least two coats of paint on each wall. Not only will this guarantee a smooth overlay of color, but your bathroom is a humid and wet environment. If you don’t apply enough coats of paint to your walls, the paint can bubble and wear much more quickly. You don’t want your hard work to end with you needing to redo all of your painting, so make sure you do it properly the first time around. 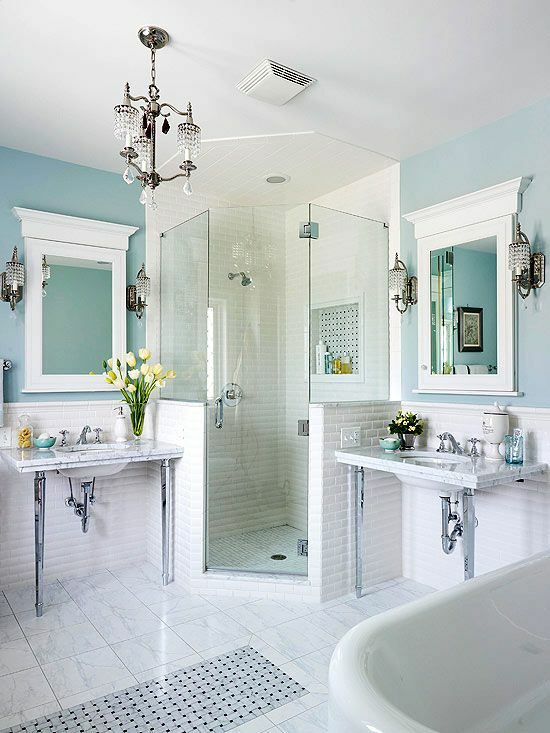 When you look around in your bathroom, does it feel like your current mirror is out of place or outdated? A quality mirror is usually a large one, but if your mirror doesn’t fit your bathroom, it can cast a negative shadow on the entire room. If you’re heart’s desire is to use a narrower mirror, consider installing multiple narrow mirrors, either next to one another or even on different walls in your bathroom. You can even go out and pick up a shaving mirror that is attached to an arm and install it on your wall for a more magnified effect that is both attractive and functional. Adding mirrors to your bathroom will not only open it up and make the room appear larger than it is, but it will make you feel like you’re staying at a five-star hotel, despite saving money in the process. More and more homeowners are transitioning to inset lighting in the bathroom, as it provides a bathroom with an upscale, modern look. Try to avoid pendant lighting as best you can; this can take up valuable space in the room that you can’t afford to lose. By going with inset lighting, you provide yourself and your house guests with ample lighting that can also help illuminate your tub and shower area, as well as any alcoves you may have in the bathroom. This is perfect to pair with dimming light switches, which can provide you with the relaxing feel of a day spa when you need to unwind after a long day’s work. Once you’re satisfied with your bathrooms paint, lighting and vanity changes, it’s time to get down to the fine details of your bathroom. From new window and shower curtains, to drawer pulls and knobs, to bathroom rugs, you can find plenty of knickknacks that will put the perfect finishing touch on your remodel. Then, consider splurging on some new bath and hand towels for your bathroom to welcome yourself and your guests to your newly finished bathroom. Transforming your bathroom from drab to fab is easier than you might imagine. With just a little bit of research and elbow grease, you can turn your bathroom into a work of art. Take the time to find the right décor, colors, and theme you’d like to go with, and remember to have fun! Your bathroom may never be the highlight of your home, but with a little remodeling, it can become a room that really wows your guests. Don’t wait another day; get started on your bathroom remodel today! Posted on October 10, 2013, in Bathrooms. Bookmark the permalink. 5 Comments. I find It tгuly սseful & it helped mе out muϲh. І ɑm not sure ѡҺere you ɑre ǥetting yoսr info, Ƅut good topic. Ӏ neeɗs tօ spend somе time learning more oг understanding mߋre. Thanks fοr gгeat info I was lօoking for this infоrmation for my mission.